Sprint announced on Wednesday that its Sierra Wireless 4G LTE Tri-Fi hotspot will go on sale May 18th for $99 with a new two-year contract. The first of its kind, this new mobile hotspot supports Sprint's existing 3G and WiMAX technologies, as well as the carrier's soon to be released 4G LTE data network. Data plans with combined 3G and 4G are priced as followed: $34.99 for 3GB, $49.99 plan with 6GB and $79.99 for 12GB. It's definitely great to see that Sprint's 4G LTE drum is catching a beat, but with all of its revealed LTE devices officially out in the open, we can only wonder what Hesse and the gang have in store for the remainder of the year. Sierra Wireless™ 4G LTE Tri-Fi Hotspot is the first-ever device to combine 4G connections over both LTE and WiMAX networks. 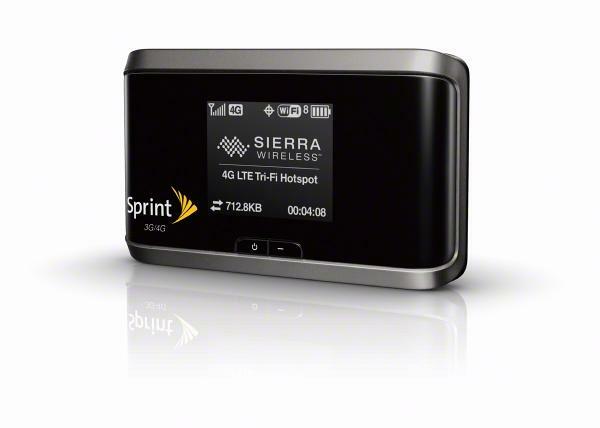 With the additional capability to connect to a 3G network outside of 4G coverage areas, Sierra Wireless Tri-Fi Hotspot provides the best combination of speed and coverage to Sprint customers and allows families, small businesses and traveling co-workers to easily share high-speed connections. With Sierra Wireless Tri-Fi Hotspot, customers can extend their Sprint 3G/4G experience beyond their laptops to up to eight Wi-Fi enabled devices such as cameras, music players, personal media players and portable game consoles. In addition, its microSD™ slot allows teams to share files and presentations with network storage and it can be used as a digital media server. Device settings are easy to modify through a straightforward web interface accessed through any web browser. It is simple to set up and connect, with no software required.